Places still available. Click on link below to book. We will have a stand at Maisebrooke Farm Shop’s Summer Fair on August 9th from 10am till 4pm. We will be selling our preserves and fruit liqueurs. We will be attending the Christmas Lights Switch on Thursday 15th November 2012. Christmas preserves and hampers available. The event takes place in the centre of Bury St Edmunds from 2pm until 8pm. Find us next to the Flying Chef Hot Dog Stall by the Market Cross. We will be trading at Halesworth Arts & Craft Fair in the Thoroughfair on Sunday 26th June 2011. It is great event lots of lovely stalls and yummy things to eat. Stop by for some Strawberry & Vanilla Jam, Hot Chilli Relish or Chocolate Chilli Brownies. 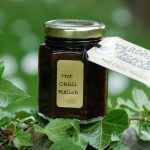 A wide selection of chutneys and jams available. The Flying Chef will also be serving up their fabulous hot dogs along with our Chilli Relish. Bungay’s famous Garden Street Market, 15th May 2011, 9am-5pm. Great day out for plant lovers, lots of interesting plant stalls, local produce stalls including ourselves and stalls selling antique and modern garden ornaments and furniture. 15th August – Pennoyer’s Fair, Pulham St Mary, Diss, Norfolk. 21st August – Burnham Market Arts & Craft Fair, Burnham Market, Norfolk. Bank Holiday Monday – Southwold Market Place, Suffolk. Our next event will be at Langham near Holt in Norfolk. Tastings will be available.